Hello, in this post we have discussed about the Bonus. Also, we discuss Payment of Bonus act, who is eligible, where is it applicable and how is the bonus calculated. Payment of bonus act applicability. 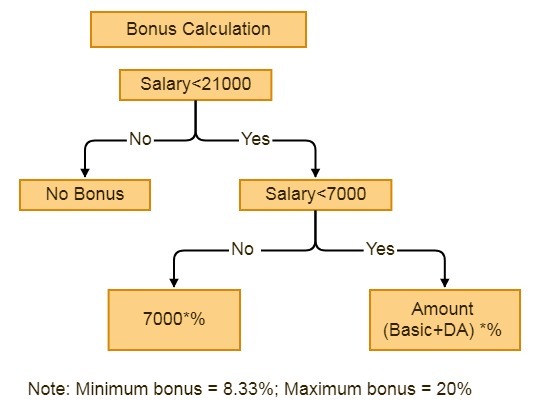 Calculation of bonus as per bonus act. The bonus is a reward that is paid to an employee for his work dedication towards the organization. The basic objective to give the bonus is to share the profit earned by the organization amongst the employees and staff members. What is Payment of bonus Act? In India, there is a principle law relating to the procedure of payment of bonus to the employees and that law is named as Payment of Bonus Act, 1965. The Payment of Bonus Act applies to every factory and establishment which employs not less than 20 persons on any day during the accounting year. The establishments covered under the Act shall continue to pay the bonus even if the no of employees falls below 20 subsequently. Note: Bonus is to be paid within 8 months of closing the book of accounts. The factory defined under clause section 2 of the factories act 1948. Every establishment in which 20 or more persons employed on any day during an accounting year. The act also applies to public sectors in some cases. When is the employee eligible for the bonus? Every employee drawing not less than Rs. 21,000/- per month and who has worked for not less than 30 days in an accounting year shall be eligible for the Bonus. Every employee will be entitled to be paid by his employer in an accounting year, bonus, in accordance with the provisions of this Act, provided he has worked in the establishment for not less than 30 working days in that year. Previously, the maximum bonus payable was 20% of Rs 3500 per month. The minimum bonus payment was capped at 8.33% of Rs 3500 per month or Rs 100, whichever is higher. The calculation ceiling of Rs 3500 is currently doubled to Rs 7000 per month “or the minimum wage for the scheduled employment, as fixed by the appropriate Government” (whichever is higher). Therefore, the cost associated with bonus payments could be double, based on the organization’s performance. If Basic+DA is below Rs.7000 then bonus will be calculated on the actual amount. If Basic+DA is above Rs.7000 then the bonus will be calculated on Rs.7000. Rahul is working as an engineer in a Company in Bangalore. His basic salary is Rs. 6,500 per month. Siddharth is working as a Sales officer in one of the shops in Delhi. His basic salary is Rs. 18,000 per month. There is no bonus applicable to employees having a basic salary of more than Rs 21,000. Seamen defined under clause 42 of the merchant shipping act 1958. Employees who registered or listed under the dock workers Act 1948 and employed by the registered or listed employers. The employees of any industry controlled by central or state government. Employees from Indian red cross society or education institutions, institutions not for profit. Employees of IFCI, Deposit Insurance Corporation, agriculture Refinance Corporation. Any financial institution is an establishment in public sector which central government notifies. You can find the attachment on Payment of Bonus Act, 1965 here. You can find the attachment on Payment of Bonus Act, 2015 here. This ends our post on Payment of bonus act applicability and calculations. If you have any doubts or questions kindly drop them in the comment section below. Check out more features of Saral PayPack Payroll software. Is it that my bonus should be calculated on the minimum wages scheduled by the govt. or will it be calculated on the salary that I draw as above? First Bonus will be calculated on your last drawn Basic at a percentage defined by your employer. The minimum percentage for calculation being 8.33% and Max 20% on your basic. Also, it may be given on one month basic on more no. of months basic as defined by your employer. For e.g, if your employer declares bonus of 10% on the last 6 months, then you will receive a bonus of = (3136*10%)*6 = 1882. Then what is the purpose of Minimum wages Scheduled by the Govt. Also is their any documented declaration from the company regarding bonus percentages. Can it differ from person to person. Thanks for your your prompt response earlier. Sir, Minimum Wages is to set a standard amount limit in case for an employee with too low wages. For bonus documentation, the company audit report and company report will serve the need also FORM C will be the confirmation from employee end. Bonus rate will be standard across the company. So you mean to say 1400 × 12 = 16800 per year. Minimum bonus is there any amendments made in that rs. 100 for 15 years experienced person. Sir, Yes. The calculation will change from company to company. As of Rs. 100 for 15 years experienced person, there is no change. My Gross salary is Rs : 25000 per month. but it divide in some heads: Basic(8000)+HRA(3000)+LTA(5000)+Conveyance(5000)+Others(4000) then, am i applicable for bonus? If applicable, how it calculate my monthly bonus? But as per the definition of salary, it includes all the allowances. Accordingly his salary is 25000 and he should not be eligible for Bonus. Request your clarification on this. Sir, the same process is applicable for bonus calculation as per minimum wages act. Eg : Mr .X joined in October 2017 and worked upto Sept 2018.
so he has completed 12 months then he has to get Basic+ DA* no of Months * 8.33%. which is correct please give us the correct calculation. Sir, you will get previous financial year bonus in current year. So according to your example, bonus calculation is from Oct 2017 to Mar 2018 i.e., 6 months * 8.33%. An employee is getting Basic salary of Rs.19000/- pm for 10 months and Rs.21500/- for other 2 months in a Financial year. 1. What is the % of Bonus. Sir, If the bonus is given in the month when the employee salary is 21500, then he/she will not be eligible for the pay. Here are answers to your query. 1) The rate of bonus will be between 8.33% to 20% as declared by your employer. 2) Minimum wages will be Rs. 7000 or Earned BAsic + DA of the month, whichever is the least. 3) Not eligible if the bonus is declared in the month when the employee basic is over 21000. While calculating the bonus we need to total up the basic earned during the FY since some employees presence may be more then minimum days but less the 365 days. Please confirm. Hello, for Bonus calculation, its monthly earned basic. Hence, consider the total basic earned for the declared months. My company says that I am “not” eligible for bonus as I am being paid incentives. 1) Is bonus and incentives same? 2) If not, Is my company right. Will I not be eligible? 1) Bonus and incentive are not the same. Is there any exception under schedule 2 of Minimum wages act that Engineering unit will not be consider under the said act for bonus calculation as per bonus act 2015 . 1. if employees drawing monthly wages is less than 21000/- then they are eligible for bonus as per act. 2. if employee on CTC base and his structure included bonus then. Madam, Yes, the employee is eligible for the bonus. The bonus will be calculated as 8.33% of 7000 as Basic is below Rs. 7000. Hence, the amount will be = 7000* 8.33% * no. of months bonus declared. Hello sir. . My salary is 17000 . In breakup basic=6800, DA=3400, HRA=3400, others=3400. So how much I get the bonus? The percentages 8.33% and 20% are fixed or 8.33% to 20%? Shouldn’t it be calculated on the actual basic amount, since it is less than 7000? Also, the diagram and example above say so..calculate on actual. My company has given me very less bonus i dont know how. I tried calculating but it is not matching to the above calculation u mentioned. Could u plz help. I am not understanding how they calculated. My Date of joining – March -2017. Sir,my gross salary is 47 000/.but my basic salary is 11,525/,hra-3458/, conveyance allowance-1440/,spl.allowances-15,600/, attendance allowance-1600/, medical allowance-900, telephone allowance-900, dearness relief allowance-10,200/.so my question I am eligible for bonus. Yes, you will be eligible for Bonus. In the given case Basic and DA i.e, (11525+10200=21725) which is greater than 21000. So, Is he still eligible? Hi, Is the employee is eligible, if he is not on the pay roll (resigned) but worked for 9 to 10 months in the financial year & Bonus is included in CTC. Sir, bonus is always on the earned value. So you need to calculate on 6800. My consolidated salary was 15000 per month, worked in a listed limited company. Bonus not paid despite my registered letter. When approached they said, I am not eligible for bonus since I left company, say not currently in the service. Since I worked full year on the consolidated payment of 15000 per month, am I eligible to get bonus, if so how much. As they said I am not eligible despite my registered letter, please inform how to get that bonus amount. NO, he is not eligible for the bonus. Please help: A person eligible for 2018-2019 bonus , his date of joining is 15.02.2017 and resignation date is 08.03.2019 so in this case what should be the calculation of Bonus? His basic is 11000/- and no DA. Accounting year april 2018 to 08.03.2019 —- during this period what should be the calculation. If a Company has sufficient allocable surplus to pay 20% of bonus, can it still comply with provisions of the Act by just paying 8.33%? The percentage can be 8.33% to 20% based on the company’s decision. So you can go with 20% if you are willing. Basic less than 7000 same will be calculated on actual basic+DA and for basic +DA between 7k to 21k will be calculated on 7000k itself. Also pls confirm if this same is applicable for centrally governed companies as well or not? Bonus will be calculated on no. of months declared by employer & not on no. of days. Min requirement to be eligible for the bonus is 30 working days and Salary below Rs. 21000 as on the day of bonus declaration. if working day is 70 & salary is below 18000 then what should be bonus amount according to 20% limit? ?